For someone who despises running, cycling is a great alternative for cardio without being bored out of your mind. My entrance into the world of cycling was kind of a fluke accident. A good friend of mine was a committed cyclist. He had the most expensive bike and completed numerous long rides (over 125 kilometers). One day, he invited me to come on a ‘short’ 32-kilometer ride. Well, not to brag or anything, but I was definitely a better cyclist than he was (with almost no experience and his old bike). I was hooked, and I even convinced my dad to buy me a bike for my birthday (although it was definitely not as nice as my friends, I still beat him). After some talks with two other friends who were also into biking, we decided to take the plunge, and sign-up for RAGBRAI (The Registers Annual Great Bicycle Race Across Iowa). It is a seven-day event with a total distance of around 875 Kilometers, with over 8,500 participants! Iowa is located in the Midwest of the United States and is known for its cornfields and wind turbines. The event took place in July, and we spent the preceding spring and summer training. Well, what we thought was “training”. We were in for a rude awakening on the first day. We began our RAGBRAI journey by doing the biking tradition of dipping our bikes’ back tires into the Missouri River (which is the Western most point in the great state of Iowa). When we left the Missouri River, I felt on top of the world. People were lining the streets cheering us on, and I was riding as fast as I could. Well, that only lasted for about 20 kilometers. After making it out of the city limits, cornfields, wind turbines, and other riders were the only things in sight. We rode almost 125 kilometers every day, and we were definitely not in good enough shape for the distance. After about 60 kilometers, we were all exhausted. I was in the lead of our small group, but I was breathing heavy and feeling the burn in my legs. Plus, the bike seat was about the size of a toothpick (that’s an exaggeration, but after five hours sitting on it, it definitely felt like that), so my backside was aching. About every 30 kilometers, there was a town where you could get food, refreshments, and relax, or keep on riding through. We usually kept on riding through, because every little town looked about the same after seeing one or two. By the time we finally made it to the first town, Storm Lake, we were absolutely exhausted. We pitched our tents in the local park with the rest of the riders, but I was panicking that I wouldn’t be able to make it (turns out I wasn’t the only one, my friend Andre was contemplating going home after the first night, but we all recovered after the initial shock of not being physically fit for the journey). But after some Gatorade and rest, I felt ok -- not great, but ok. Two of my friends, Andre and Josh, were so exhausted that they fell asleep in their lawn chairs and couldn’t walk down to the gas station for food and more Gatorade. I know I keep mentioning it, but Gatorade was our most valued possession, it got us from one point to the next. There were countless times where the only thing keeping me pedaling was the thought of an ice-cold orange Gatorade. I don’t think we would have finished without it; water just didn’t cut it. Gatorade was our fuel, our lifeline, and our best friend. After a little rest, I explored the city and went swimming in the lake. When I came back, my friends were still out-cold. The next day was much better because our bodies were [somewhat] adjusted to the intense physical demand and heat. Each Day of biking was pretty much the same—lot of corn fields and wind turbines. However, A common belief is that Iowa is flat. If anyone tells you that, they are a liar and need to be called one immediately! They aren’t the steepest hills I’ve ever seen, but they are definitely steep enough, and very long. It’s cool to note that we finished our 875 km journey in traditional RAGBRAI fashion, by dipping our front tires in the Mississippi River, the most eastern part of Iowa. 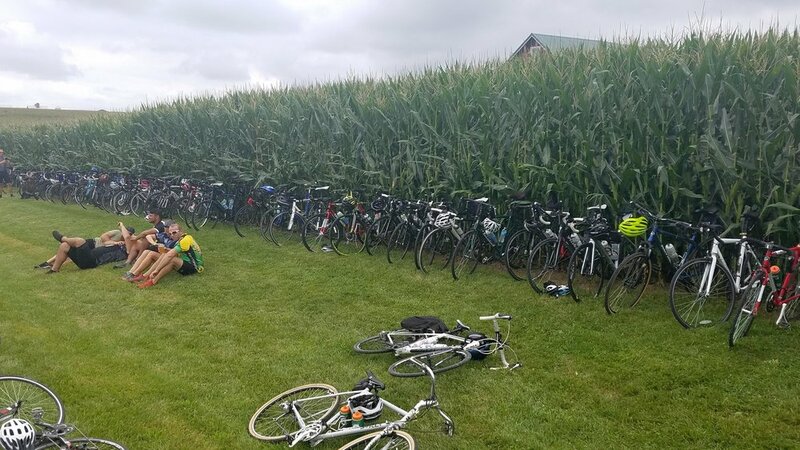 Biking in general is great because it allows you to get great exercise and see some cool scenery, but RAGBRAI takes it to the next level -- in every sense of the phrase. I biked a ridiculous number of kilometers every day, saw some really beautiful rural landscapes, and got to bike with some of my close friends. Teamwork is important, as you have to call out when a car or pothole is coming up and have to “draft off” of each other in order to reduce air drag. But the great thing about RAGBRAI was that it wasn’t all about biking, there were a bunch of cool events every night that helped us come together as friends. One of the main features of RAGBRAI isn’t the riding, it’s the cool cities you get to camp in and the unique programming they put on (some were much better than others). Some cities aren’t even worth mentioning because their ‘programming’ was free entrance into a museum or free beer (which we weren’t even allowed to have because we were only 18 and the drinking age is 21—trust me, we tried to get around it, but man, are they strict). The fourth night, in Cedar Falls, was definitely one of the most memorable. That night, when the intense heat was finally cooling off and we could fall asleep, a concert started literally right next to our camp grounds. Since we couldn’t beat them, we joined them, and that was definitely the right call. They had a Queen cover band and I have never heard anyone who sounds more like Freddy Mercury than, well, Freddy Mercury. After the concert was over, we were still so pumped up from the music that we went to the local gas station and got some cigars. It was great to just walk around and talk after another long day of biking; moments like that definitely made the trip. The next two nights all had great music shows as well! The head line performers were Dennis DeYoung (former lead singer of the rock band Styx) and the rock band Cheap Trick. Let’s just say I was definitely impressed with most of their entertainment, and looking back, I don’t think I’ll ever see so many cool shows in such a short time period! 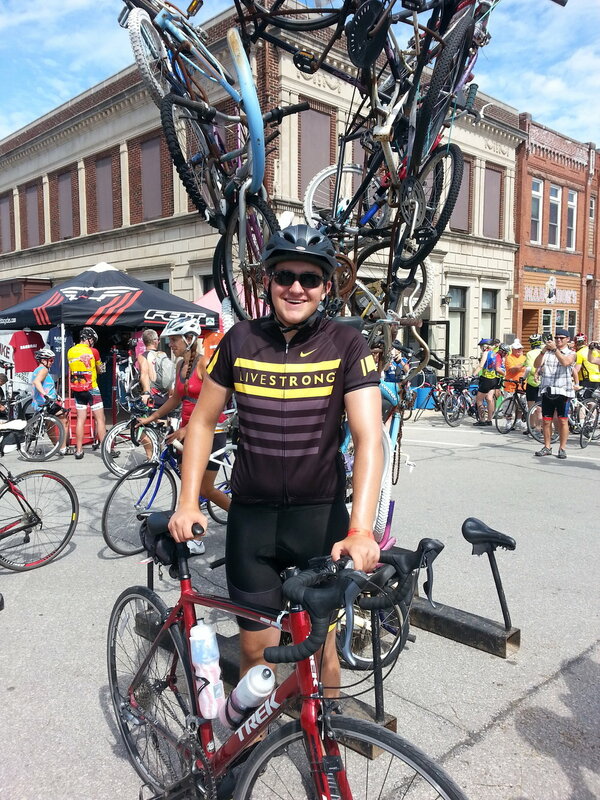 Although I only did it once, RAGBRAI took me from a bicycling novice and turned me into a semi-pro. I had no idea what I was getting myself into, but 875 kilometers, a lot of Gatorade, and a couple great concerts later, I felt like I could compete in the Tour de France (not really, I would definitely die if I did that). I did, however, feel pretty confident in my biking skills and hope that one day I can go back and do it again! If you are interested in trying, all it takes is a sign-up fee and supplying your own bike, a tent, some personal items, and of course, being in good enough shape (I’ll leave it up to you to decide that for yourself). Just remember, Gatorade (especially orange because it tastes the best) will be your best friend along the way. Philip Kopatz is a senior at Walsh University from Ohio, United States. He is majoring in history and psychology and plans on attending graduate school and eventually becoming a history professor. At Walsh he is active in student government and is a professional writing tutor. When he has free time, he enjoys hiking, biking, reading, and traveling.